As we stand on the Parisian streets constructed on the Leavesden set of Fantastic Beasts: The Crimes of Grindelwald in October 2017, director David Yates reveals that the current script they're working from is J.K. Rowling's 27th (!!!) draft of her screenplay. This is still midway through production and with eight more weeks of filming to go. SnitchSeeker got the chance to visit the UK set of Fantastic Beasts: The Crimes of Grindelwald last fall, and will reveal all the new details from the visit, including new sets, plot points and interviews. This half of the set report will focus on all non-Paris locations and scenes, as the French capital of course plays a huge part of the movie and will require its own post, which can be found here. HEAVY SPOILERS BELOW FOR THE MOVIE, SO DO HEED WITH CAUTION. Much is revealed on set about the hushed-about plot of the sequel to Fantastic Beasts and Where to Find Them, including the intricate streets of Muggle and Wizarding Paris, the Ministère des Affaires Magiques de la France with its large glass dome, and the reunion of our heroes ... for now. It must be stated, without shadow of a doubt, that art director Martin Foley knows the entirety of the plot at this point. As we visit his vast room full of concept art (which has some HUGE spoilers) for the sequel, and the miniature models of all the Parisian and London locations, the story starts to become a bit more clear. The film starts off in New York City - this was already confirmed awhile ago, surprisingly by a LEGO set - where Grindelwald escapes from the MACUSA basement-level prisons (where he's seen as a "bit of a hero in the criminal underworld," according to Foley). Do note that the following from Foley is essentially a play-by-play of the starting scene of the movie, and should be avoided for those who don't want to be outright spoiled. Martin Foley: So as [Grindelwald]'s getting transported from the basement up to the roof of the MACUSA he's going to-- basically they’re going to send him back to Europe to be tried for his crimes in Europe. The Americans kind of want to get rid of him. He's a bit too hot to handle. As he's going through here they all start cheering and that is quite a ... high kind of volatile situation. He takes a lift up to the roof. And in there he comes up in the lift and there's a magical carriage which is actually pulled by Thestrals. But then as they're plummeting, also, their wings open and we’re on to this kind of roller coaster ride. And as he's going back-- I'm not going to get into the details, but there’s an escape plot occurs here and it's very, very high ... high impact big action sequence at the beginning of the film. It's going to kind of blow everyone away. 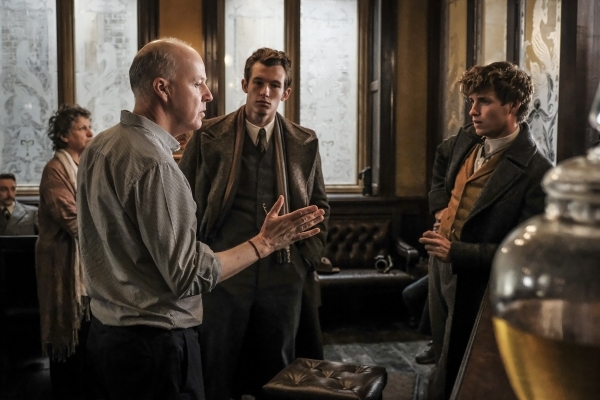 Enjoy the new behind-the-scenes shot of the Scamander brothers with David Yates on set. We're then whisked to London, where one Newt Scamander — now the reluctant celebrity thanks to his smash hit book, Fantastic Beasts and Where to Find Them — can be found. He's in a dire situation, and his brother Theseus Scamander (head of the British Auror Office) is with him at the British Ministry of Magic for a trial. There are slight differences between the Ministry in 1927 and the one Harry Potter saw in the original movies, including new (or rather, old) sweeping corridors. Callum Turner, who plays Theseus (older brother of Newt), talked about his rigid, by-the-books Ministry official character. "I play Theseus, who is Newt's older brother, even though I'm younger than Eddie, which is interesting, and he's kind of the opposite of Newt," Turner said on set. "[Theseus]'s gone through the same schooling obviously, but once he got out, he decided that the establishment was the way to fight the good fight. Theseus is or may be quite more rigid or just part of the establishment. You know, he's the head Auror at the Ministry." Callum Turner: It was kind of the normal process of going in with Fiona Weir, who is the casting director and then having a second meeting with David [Yates] and then having a third with Eddie, which I was really, really excited about, working with ... like workshopping it with David and Eddie. I was over the moon to just go and meet him and actually I did this weird thing, 'cause we-- on the first take, there's this scene, and uhm ... I just kissed him on the head. We weren't even recording. It's not in the movie. There's no reason for me to have done it, but uhm ... yeah, I think that's probably why I got the part. So we go back to the Ministry of Magic, and why Newt's in trouble — which is related to his fun excursions in the first movie, including the long travel to the United States just to release a magical creature. He's being tried. And of course, who saves him, but one Albus Dumbledore. While no one on set flat-out stated it, this is presumably the first scene featuring Jude Law as the Hogwarts professor (and yes, we can confirm that Dumbledore teaches Defense Against the Dark Arts at the time). Foley delves into the basis of the sequel, which is the "chess match" of sorts between two of the most manipulative characters J.K. Rowling created in her Wizarding world — Dumbledore (using people for good) and Grindlewald (using people for bad). After he meets Dumbledore in London (featured in the trailer already), Newt heads back to his London flat (address at Bishops Terrace S.E.II). A description of Newt's apartment from Foley can be read below. Martin Foley: In his basement it's quite an average sized property, but downstairs he's done-- used bit of magic and has extended his kind of Georgian basement into this amazing magical menagerie/hospital. So it's a bit like a kind of a physical extension of his case. The case is what he takes around. And he can-- you know, he has those different environments for the creatures. So they are kind of thrown together. They were canvas and kind of a bit uhm ... Heath Robinson. But the animals, the creatures felt at home and they are more expansive for them. And this is like a physical more kind of architectural version. So in each of these alcoves, you know, you just have to move around as we go. But each of these alcoves, there will be a new environment. So there will be like a Augurey or, you know, this is a new-- some new creatures, some creatures from the last film. Of course, in Newt's flat we'll find his assistant, Bunty (played by Victoria Yeates). She is a massive fan of Newt whom she met at his London book release (and is also a bit in love with him), and now takes care of the magical creatures in his huge, magically-enchanted basement (which has a Hogwarts-style moving staircase, by the way). Redmayne stated she only has one or two scenes in the movie, but is still an intricate part of the tale. Finally, for the last non-Paris related news, we head back home — Hogwarts. Of course, fans already know that Hogwarts will be featured when Newt was a young Hufflepuff student there, as well as a second time — in present-day 1927. The same Hogwarts sets used in the Harry Potter films were brought back again for Fantastic Beasts: The Crimes of Grindelwald, but changed up a bit to fit with the times — including the Defense Against the Dark Arts classroom. Yates teased a bit about how much Hogwarts would be featured in his sixth foray into the Wizarding world: "We're there very briefly," Yates said. "You know, right in the middle of the movie, we go back for about 10 minutes to Hogwarts and see it in 1927. It was a very organic natural part of the development process that took us back there." As we delve back into Hogwarts, we of course acknowledge the iconic House robes. Colleen Atwood, the Oscar-winning costume designer of Fantastic Beasts and Where to Find Them, revealed she created two sets of robes for the two time periods during which the school is featured. Colleen Atwood: In this movie, I had Hogwarts in two different time periods, so for their earlier period I did a nod to the earlier period like a longer skirt, ankle boots, you know, the sweater, shirt setup’s the same, and then for the ‘30s take on it, I did a s-- you know, I just shifted it into that. The robe itself is based on a medieval robe basically; those robes are a very old design. I sort of took them out of the choir robe thing and did a little bit more trim on them; I did some velvet trim on them and, you know, and then the hoods are the House colors inside and so we did some fun things like that but they’re pretty much-- you know, they’re pretty classical. Along with the robes are now Hogwarts-crest branded satchels, revealed in the props room by Prop Modeller Pierre Bohanna — which, by the way, were never featured in the Harry Potter films and created especially for the 1920s Hogwarts students. Bohanna gave a reason as to why they were never show in the 1990s-set Potter saga. "Well, no, because they're period [pieces]," Bohanna said. "Well, no, no, remember, this is in the 1920s, so it's a different time even then, isn't it? So. Yeah. Isn't it nice? Nice little touches." Redmayne talks about his younger counterpart — or rather, teen Newt — played by 16-year-old British actor Joshua Shea. Redmayne stated he got the chance to meet and speak to Shea about playing Newt at various ages, and the Magizoologist's many ticks and mannerisms. Eddie Redmayne: I haven't worked with a younger actor in that way and it was very interesting because David [Yates] said he had found this guy and he was completely wonderful. And he wanted me to spend some time with him, but also, David had found in the audition tapes, it's like instinct [Shea] had, which he didn't want, rightly, touched. So it was sort of this weird thing where I just didn't want to screw it up, basically. But what was so interesting is [Shea]'d really watched the first movie, and we spent a day just talking about the character. And he had had the gait and the aversion to eye contact, and understanding the elements to Newt and he was on it before I'd even-- I didn't talk about it. And it was interesting hearing what his take on Newt was. Yes, we're aware that most of the main characters have not been mentioned yet — for good reason — they're mostly in Paris. Tina heads to Paris to find Credence; while Jacob and Queenie have a more curious tale as to why they end up Europe. You'll find out why this November.